This is the cheapest way to ship a bike in the US. Most airlines have hefty charges for your bicycle as accompanied luggage, so this compact box and subsidized FedEx ground rates are the best deal I’ve found. It will cost about $100 when you are done if you use their full service. While it is the cheapest way, it is not the most convenient way. Here is how it works. 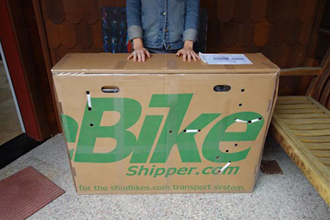 ShipBikes.com will ship you a box, called an Ebike Shipper, to your sending address. Inside the box is a much larger box folded up. You unfold that box into two parts (top and bottom), and then you disassemble your bike and tie it in. 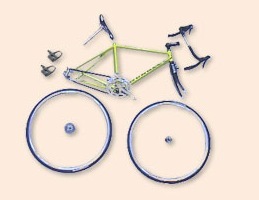 You need to remove both wheels, pedals, handlebar, seat, fenders, racks, and maybe the front fork. It will take a hour or more, and can be done with two common tools. (And of course you need to rebuild it at the other end.) Then you tape up the box, print out a label from an email they send you, and then call FedEx who will come to your address to pick it up, and then deliver to the address you designate. This delivery and pick up is really fantastic at the end of a bike trip when you are shipping a bike back home from a far destination. The shipping box is very cleverly designed to arrive in the mail folded up and to just squeak under a pricing threshold when unfolded. Thus the tight fit and the need to strip the bike down. By coming under the FedEx price threshold the box will ship in the US for about $53. The cost of the box and shipping it to you is $48. You can stuff some gear like a sleeping bag and pad into the box for padding but it won’t hold much beside the bike. The alternative is to use an AirCaddy from the same company, which is a triangular shaped box that takes the bike with almost no disassembly. (The AirCaddy box is also reusable.) You can load it in 10 minutes. But it costs $99 to reach you, and about $96 to ship because of its larger size. That extra simplicity will cost about double the ebike box option. But this is by far the most convenient way to ship a bike: Box comes, you unfold it, pop bike in, they come to get it, then deliver it its destination. Done for $200. Of course if you have use of a car you can find a free used box from a bike shop, drag it home, and ship it yourself, but you’ll pay higher rates, close to $100. ShipBIkes has some kind of deal with FedEx that gives you a discount on the freight. Or you can get a free bike box at a shop and then haul the packed bike-in-box to the airport (and then out of the arriving airport), but for most airlines this will still cost you about $90- $100+, and it requires a car, which you may not have a the end of a long tour. There are still a few airlines that will ship a boxed bike for $50 as accompanied luggage, but they are rare, and you still have the problem of getting the box and then getting the bike to the airport and back. 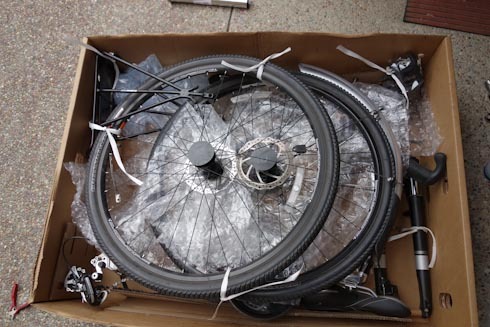 Lastly, the ebike box is so well designed that there are four layers of cardboard around the perimeter, everything is tied in with straps, the wheel axels protected with rubber bumpers, and the whole thing much more protected and secure than a free bike-shop box, which has been used and is not meant to be shipped in luggage. I recently received a bike shipped this casual way and the front wheel was so damaged it had to be rebuilt. The bike we shipped via ebike was intact. Any way you do it, it will cost you about $100 to ship a bike in the US. (ShipBikes will ship overseas but the costs vary so much I can’t summarize.) 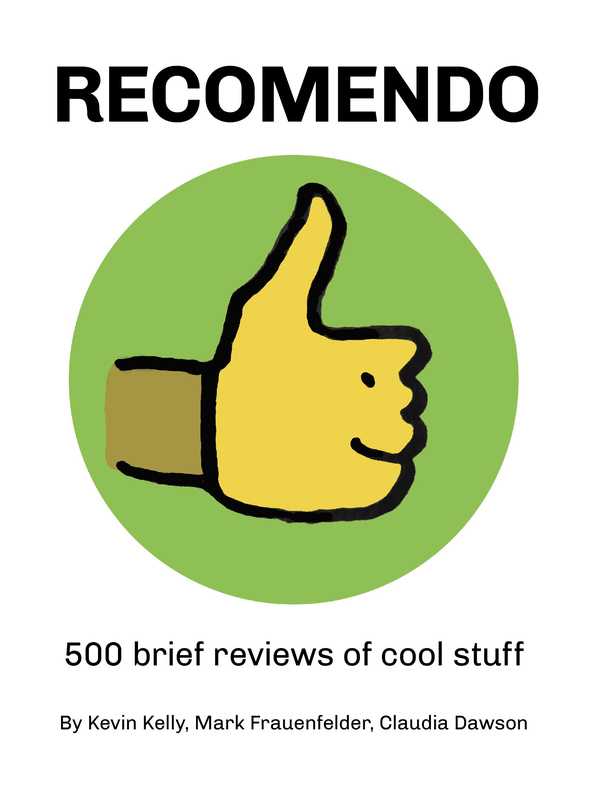 But if you count the hassles of the alternatives, the hassles of disassembling your bike into a provided box and having them pick it up to deliver works out to be the cheapest way to do it.